When I mentioned I was choosing to visit Singapore to a few people, they questioned why I wanted to visit what they believed to be a dull city that lacks any real culture and grit. While this may have been true 10 plus years ago, the Singapore I encountered on my two visits is a vibrant city with a mesh of cultures from nearby lands and afar which all combine to give visitors to Singapore a very unique experience in Asia. There are no traffic jams, pollution, poverty or chaos, everything is clean and things run as they should. It’s nothing like what I have experienced in other parts of Asia! Singapore is a fast moving city that is changing and growing everyday and is one of the world’s major commercial hubs. It is in the top five biggest financial centres as well as top five busiest ports in the world, with its economy relying heavily on trade. It also ranks as one of the best countries in terms of education, healthcare, government transparency and economic competitiveness and its residents are among the happiest in the world. While, as a whole, it isn’t cheap like other parts of Asia are famous for, it doesn’t have to break your bank with plenty of free or cheap things to see and do, places to stay and areas to find decent cheap meals. 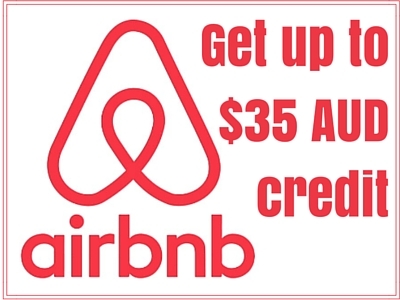 In contrast, if your travelling and looking for that little bit of luxury after a trip full of backpacker hostels and street food then you will find exactly what your looking for in world class hotels and restaurants that will probably break your bank but are worth every cent. There is so much to see and do, from incredible feats of architecture to some of the worlds top shopping experiences to getting up close with wildlife. No matter what your interested in, you will find plenty of things to do in Singapore. This is a big list and it can be overwhelming at first but remember, not all of these are essential. If your only in the city for a short time, pick a few you really like the sound of and do them right. You can always come back right! Nothing is more iconic in Singapore these days than the Marina Bay Sands building. If your not familiar with it, its that giant building that looks like a surf board being held up by three massive glass pylons. Inside it is mostly a very expensive hotel along with shops and a casino. It’s up the top on the ‘surf board’ that you want to be. The Sands SkyPark offers some pretty spectacular views looking out over the city and its here that you can get a sneak peek at the world’s highest rooftop pool which is accessible to guest of the hotel only. Address: Entry to the Sands SkyPark is via 10 Bayfront Ave.
Another way to get a birds eye view of the city which this time includes a view of the Marina Bay Sands is to ride the Singapore Flyer. 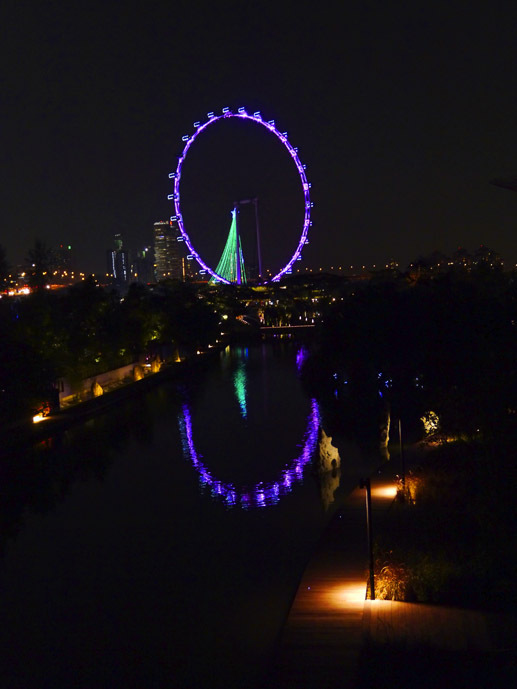 This giant wheel, similar to the one in London and other cities around the world, is the biggest of its kind at 165 metres from the ground right up to the top. Climb into an almost entirely glass cabin for a slow ride that you almost don’t feel at all. Cost: A standard flight costs Adults S$33.00, Concession S$24.00, Child S$217.00 | Other attractions and packages available at higher prices. Gardens by the Bay is one of the most remarkable sights in Singapore in my opinion. It isn’t your average garden attraction either with over 100 hectares of things to see and do. 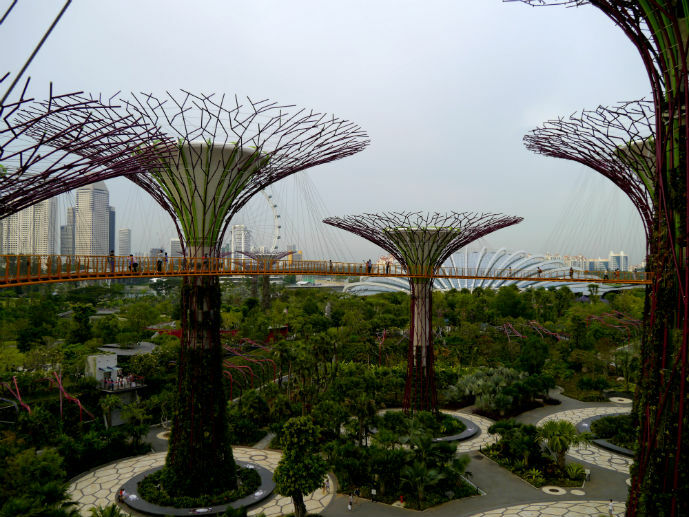 Hard to miss is the incredible Supertress which are a group of 25-50m vertical gardens in the shape of trees that come alive with lights and music at night and provide shade during the day. Explore the Cloud Forest, a temperate zone full of humidity loving plant life. Or step into the Flower Dome to see some spectacular flower displays with species from all over the world. Read More: Choose from these luxurious Airbnb Singapore properties for you next visit. Once you’ve taken in the newer wow sights around the Marina, make sure you take a stroll around the promenade that lines the bay to see the traditional, long time symbol of Singapore, the Merlion statue. 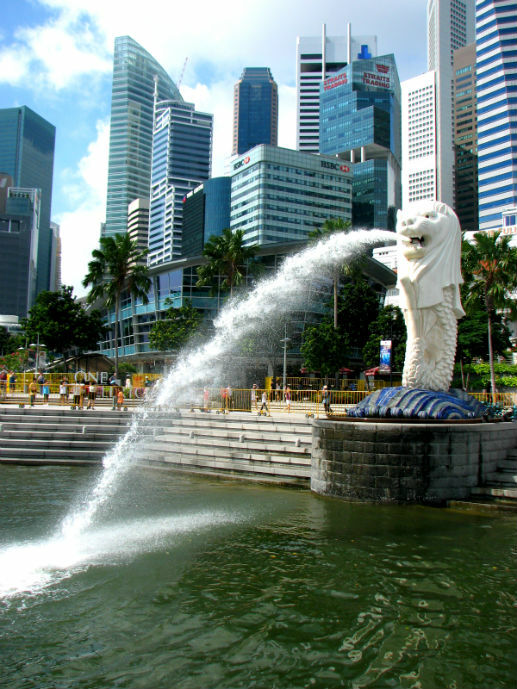 Spouting water out into the bay, the 8.6 metre tall statue is a lion head attached to a fish body and has been used as the symbol of Singapore since 1972. Hours: Visit during the day or at night to see it lit up. On your walk around the promenade at Marina Bay it is a must that you take a stroll over the world’s first curved double helix bridge. 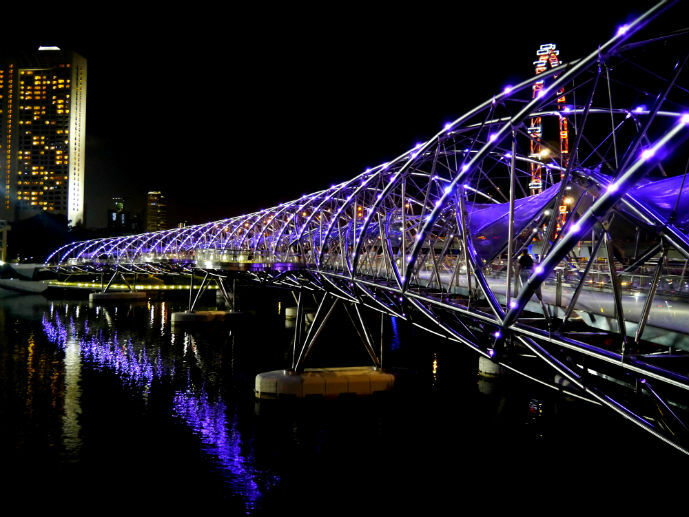 Opened in 2010, this pedestrian bridge, while impressive during the day, is best views at night when it is all lit up. 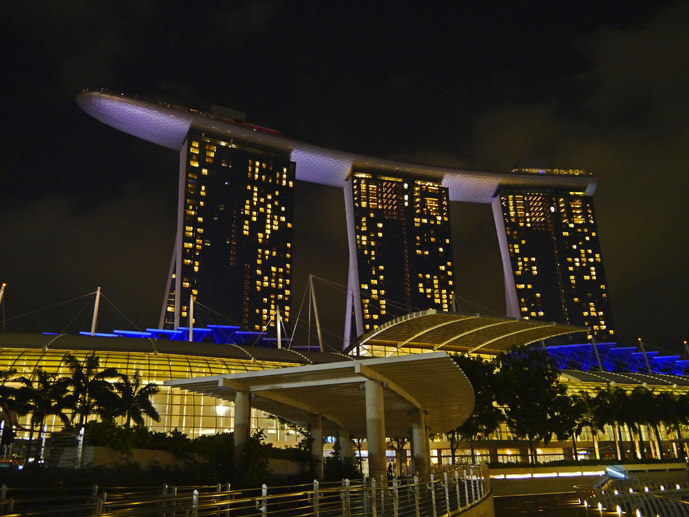 Address: Connect Marina Centre with Marina South near the Marina Bay Sands. 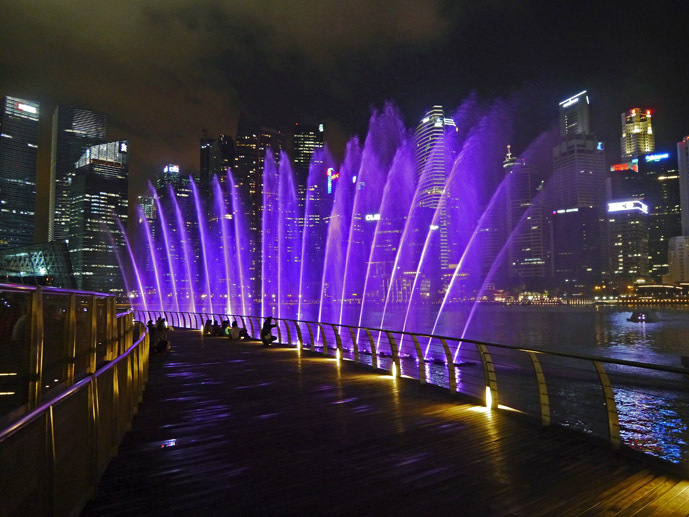 This award winning light, music, colour and water show comprises 13 minutes of visual effects, lasers, LED lights, water screens and video projections all in time with classical music out over Marina Bay. Its the perfect way to end a day sightseeing around the Marina area. Address: Best viewed from the Event Plaza, Waterfront Promenade at Marina Bay Sands. The ArtScience Museum is one of the newest art and exhibition spaces in the city. It hosts both permanent and visiting exhibitions on things like photography, world class artists, architecture and design and the worlds latest technology. Even if your not keen on going inside the lotus shaped building is worth a look itself. Address: Part of the Marina Bay Sand complex. Cost: Access to all exhibits – Adult S$25.00, Concession S$23.00, Child S$16.00 | Tickets also available for individual exhibits. Chinatown in Singapore has been home to the city’s Chinese community since 1822 and is one of the nicest Chinatown’s I have visited so far around the world. The area is home so some of the city’s oldest architecture in the form of religious buildings which are of great importance to not just the Chinese community. Check out Tian Hock Keng and Sri Marianmman Temples, wander past the traditional shop houses that are tucked neatly below the skyscrapers of the surrounding area, visit the Chinatown Heritage Centre to get an insight into the history behind this area, try some of the local food with a special focus on seafood and watch the locals going about their day and playing chess. Cost: The area is free to explore. Some attractions will require a small entry fee. Hours: Explore during the day to see the temples, do some shopping and visit the Heritage Centre. Come back at night for eating and to see the area lit up. 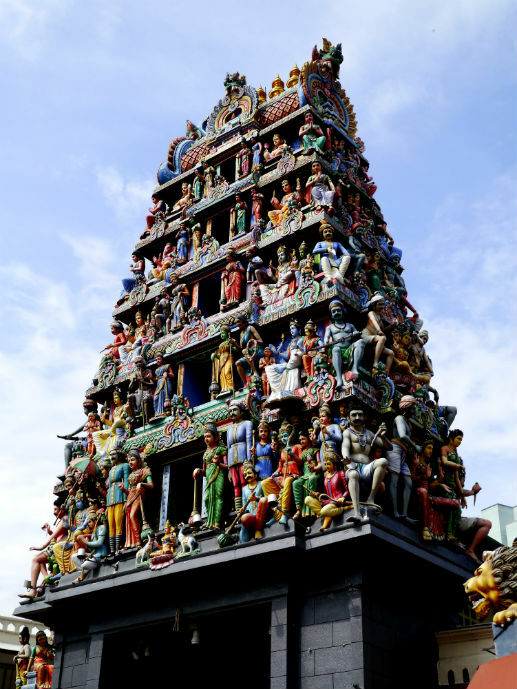 Visiting Little India provides visitors with an intoxicating experience for all of your senses. From the fragrant streets lined with curry restaurants and spice stores to the music blaring from the windows and chatter of locals to the colourful sari shops, traditional Indian trade stores, mulit-coloured buildings and cultural attractions. 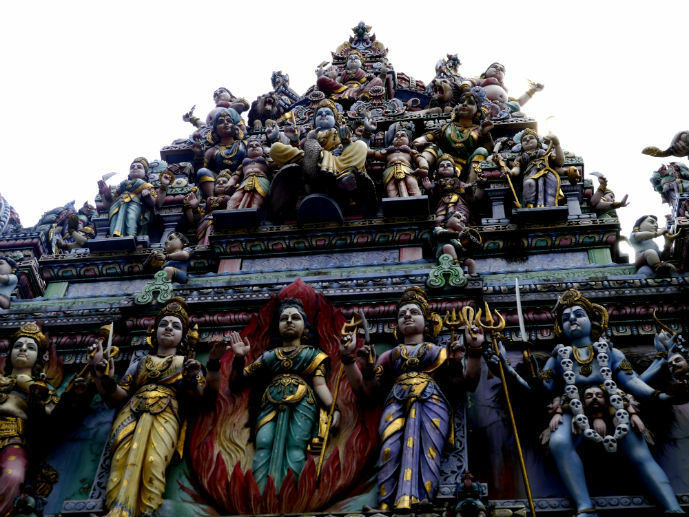 Once you’ve filled your senses and your belly check out the Sri Veeramakaliamman Temple which is one of the most important temples in Singapore. If your after a bargain then make sure you check out the Mustafa Centre, a 24 hour shopping mecca. It is one of the city’s biggest department stores and sells just about everything you can image and more in every price range. Hours: Little India is alive 24/7 so no time of day is a bad time to visit. This was the area that was home to the old Malay royalty in Singapore and has been a Malay-Muslim cultural area ever since. The area is a really nice mix of old and new and you can find out more about its history at the Malay Heritage Centre housed in the former home of Malay rulers. 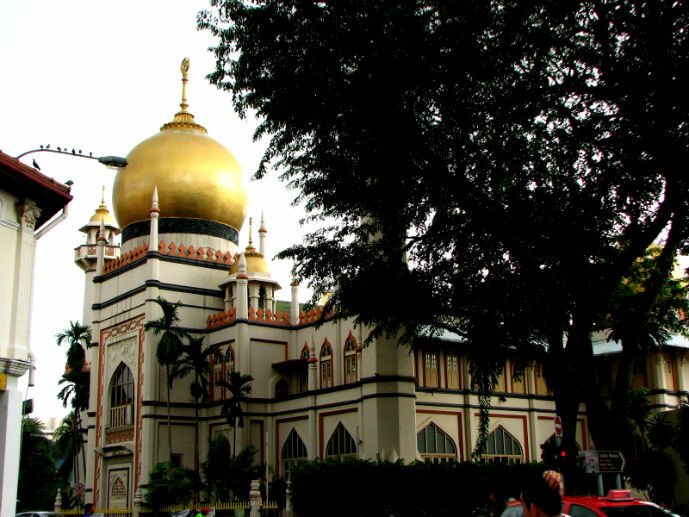 Also be sure to check out the gold domed Sultan Mosque which is one of the oldest and most important mosque in Singapore. Finally, Kampong Glam is the perfect place to pick up unique souvenirs, textiles, Persian carpets and handicrafts. Take a walk down Bussorah Mall, Arab Street and Haji Lane which is covered in cool street art. Hours: You’ll get the most out of visiting this area during the day. The most accessible island from the main island of Singapore is Sentosa Island, home to a ton of entertainment based attractions that are fun for people of all ages. While Sentosa Island is a lot of fun, it is incredibly expensive as each attraction requires its own entrance fee. 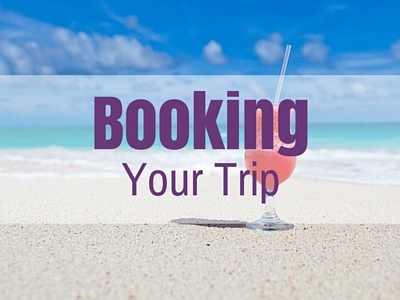 I suggest just choosing one or two activities to make your visit more cost effective. The below list is just a taste of the most popular attractions. Keep an eye out in the coming weeks for more comprehensive guide to the attractions at Sentosa Island. 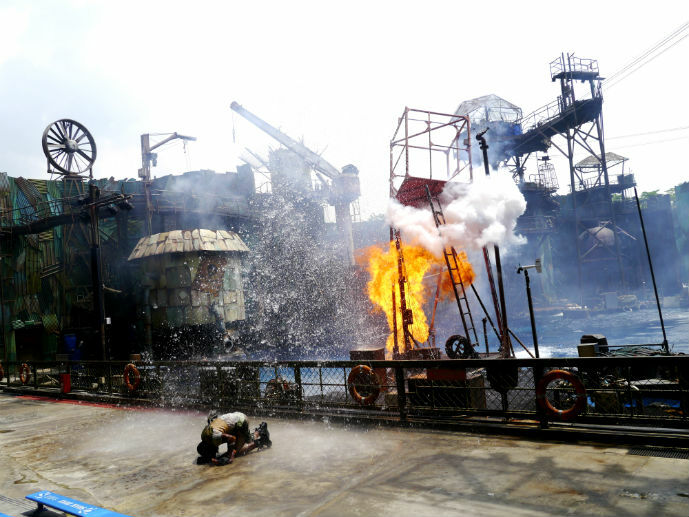 Universal Studios Singapore – The Singapore branch of this popular theme park. Packed full of extreme rides, entertaining shows and well themed landscape. Adventure Cove Water Park – Water fun at its best. Ride the slides, float around the man made river or take a dip in the wave pool. S.E.A. Aquarium – Get a closer look at underwater life with over 800 species of marine life. MegaZip Adventure Park – Whizz over the jungle canopy on one of Asia’s most extreme ziplining courses. Tiger Sky Tower – For views of Sentosa Island and other surrounding islands take a gentle ride up the 131 metre Tiger Sky Tower. Butterfly & Insect Kingdom – Get up close to some of the worlds most beautiful butterflies, creepiest crawlies and unusual insects at this attractions surrounded by lush rainforest. Songs of the Sea – Light, fireworks and laser show put on every night to a musical sound track. Cost: Entry fees for the above attractions start at S$15.00. Check out the below website for more details for each attraction. Hours: Hours vary between the attractions. Check out the below website for more details for each attraction. 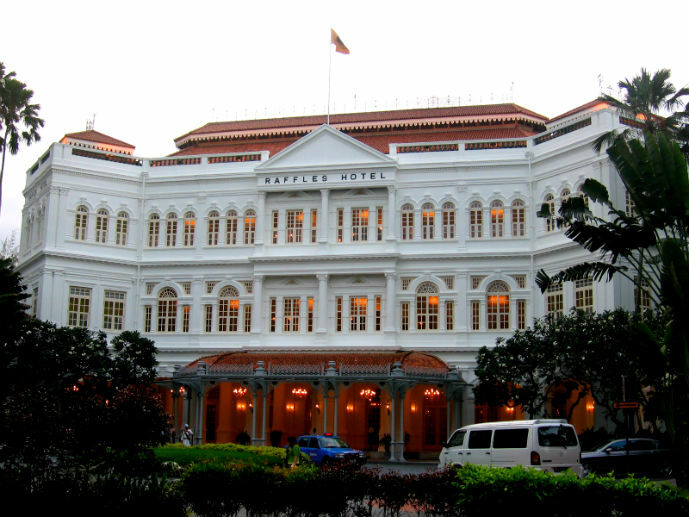 The most famous hotel in Singapore is undoubtedly the Raffles. Home to the Singapore Sling, a world famous cocktail, you can have a drink in the Long Bar with its classic cane furniture, nibble on some peanuts and throw your shells on the ground. Not what you expected for a five star establishment! Singapore Zoo and its Night Safari are two of the best zoological attractions in the world. Unlike most other zoos, Singapore Zoo is designed with open enclosures which makes the animals appear almost within reach. It’s a beautiful place to spend a day wandering around and there are lots of shows and opportunities to get up close to the animals, like having breakfast with the friendly resident orangutans. Then, come back at night time to experience the Night Safari. Climb aboard the guided tram ride that takes your through seven geographical zones of the world while your guide shares bits of information on the animals and their habitat, take a walk on one of the many night trails or experience one of the nightly cultural performances. Cost: Zoo Adult S$28.00, Concession S$12.00, Child S$18.00 | Night Safari Adult S$39.00, Concession S$16.00, Child S$25.00 | Combine tickets available at discounted prices. What’s top of your list of things to do in Singapore? Or have you been already, what did you love about it? I once had someone tell me that Singapore was like the Canberra of the world. So far from the truth! I loved the whole week I spent there and will be going back for more of what I missed and to revisit some favourite places like Arab St which I have fondly renamed fabric & ribbon heaven. And I know a certain boyfriend who would love to go back to Adventure Cove! OMG that us so far from the truth! Fabric & ribbon heaven, love it! This guide to Singapore is one of the best I’ve ever seen, so detailed! I spent a few days there and it’s full of free and budget friendly activities, I couldn’t actually believe that! Thank Agness, appreciate your nice words. Its a great city to just wander around in and look at all the amazing architecture which is free! Singapore is a vibrant country! Little India looks so pretty! Thanks for laying out such a helpful city guide. Thanks Renuka! It’s and awesome city. Thanks for this awesome guide, Jen! I’ve been to Singapore a couple of times so have done a few of the highlights like Little India, the marina, the night zoo and Raffles, but Kampong Glam looks great, I’ll definitely check it out next time I’m in town. Thanks Hayley! It’s one of my favourite cities so I foudn it so easy to write about. @FansOfChangi, I love that! I think they might have themselves a new follower in my now. Best airport I have ever been to, by far! This is an awesome guide. I’ll be visiting Singapore in a few months. Some of the things I already heard about but the suggestions on places to eat were really helpful. It can be so tricky to know where to go in a new city. Any other tips would be amazing. Thanks! Thanks Shereen! There are great and cheap places to eat in Chinatown and Little India as well. According to my parents, the food court in the Mustafa Centre in Little INdia is supposed to be good as well. I didn’t get there but hopefully next trip. Have an awesome time and if you have any questions please feel free to email me. Yes! The Mustafa Centre rooftop! It’s half restaurant half buffet! We had the buffet for something ridiculous like $10-$15! Food was amazing and it has a view of little India. And it was perfect fuel for more shopping! I wish I had gotten there myself. I guess I’m just going to have to go back! I love Singapore as a city to spend a few days in, you need a least a few days to have time to eat enough of the wonderful food which is enough reason to go. There is so much food in Singapore. I love that you can find something to eat from just about every corner of the world quite easily. Me too! Maybe we can pool our money one day just to afford one of the cheapest rooms just so we can enjoy that rooftop pool! I love Singapore and have done all of your mentions except Sentosa which is not really my thing. Two fun shopping areas are Orchard Drive (the glitz like Rodeo Drive in Los Angeles) and Buggi Street on the opposite scale withcheap and imported goods. Thanks Noel. I agree, Sentosa Island isn’t for everyone. Thanks for adding those great shopping areas, I love Orchard Road! For me, Singapore’s main attraction will always be the amazing food, which is very reflective of its cultural diversity and, in the case of the local Peranakan cuisine, the resulting synergy. To really appreciate Singapore’s humble ‘kampong’ beginnings, head to the Changi Point Ferry Terminal and take a ten minute bum boat ride across the Strait of Johor to Pulau Ubin (Island). Rent a bike and pedal the narrow road and trails amid rustic old village homes, stands of lush palm groves and jungle, and mangrove swamps, to see what Singapore was like before it developed into one of the ‘Asian Tigers’. 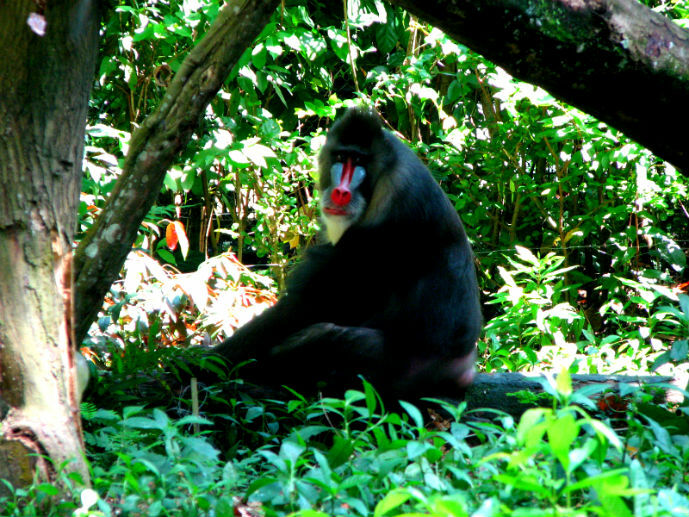 Also do a jungle hike in the Bukit Timah Nature Reserve, though mind the mischievous wild monkeys hanging around the park entrance. That’s perfect timing! Hope you have an amazing time and let me know if you need any more tips. Very detailed guide! This post will fill a two day stay in Singapore. I love your photo of the SuperTress at the Gardens by the Bay. It actually looks a jungle amidst the city. Great roundup of things to do in Singapore! I have been, and I was able to experience many of these activities! Gardens by the Bay was especially beautiful at night when the Supertrees are all lit up. I don’t remember seeing that Helix thing, don’t know how I missed it! And at the Marina Bay Sands, one handy tip is to go to the restaurant (Ku De Ta) instead of the Sky Park…you get pretty much the same views (and an awesome view of the pool) and all you have to pay for is a drink or something which for us came out much cheaper than the Sky Park! Great tip Leah. Thanks for sharing! I’ll remember it for next time. I can’t wait to return to Singapore and stay long enough to explore your list! The Gardens Trees were stunning the night I was there on a long layover. Thanks for sharing all these. Thanks Elaine. Its a great city for a layover but I hope you get to explore it more next time. Can’t wait for an opportunity to visit Singapore. I’ve heard and read so much about it! Your tips will surely be helpful ! Thanks for sharing them! Hope you get over there soon Chaitanya, I’m sure you’ll love it! 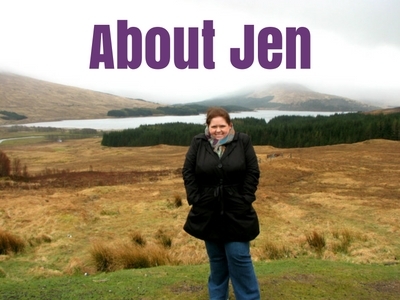 Great article, Jen! I recently visited Singapore myself and was surprised at how many things there is to do around town. I absolutely adored Gardens by the Bay at night – definitely the highlight! Thanks Miriam! Glad you enjoyed the city too. This post is right on time, we’re heading to Singapore in a few weeks. I will be sharing this with my travel buddy. I hear that Singapore is an amazing city. Is there anything else that we should see? That is perfect Reginia. This list covers just about everything I have seen and done in Singapore. If you have more than a week there you could spend some more time on Sentosa Island and don’t forget to try lots of food! I have heard that the food is remarkable in Singapore, especially market and street vendors. I guess eating would be my highlight. The food is pretty awesome and you can basically get cuisine from every corner of the world. Really useful post! I’ve always been strangely attracted to Singapore and I’m not sure why, but I have been fairly intimidated by the cost of everything. It’s great to know there’s plenty that’s free or cheap. Their is plenty to keep busy with the free attractions. If you mixed them with one or two of the paid ones you can easily fill a few days. Plus food is so cheap and plentiful. Singapore looks so awesome, great ideas Jen – I didn’t realise there was that much to do! My best friend went a couple of weeks back on a work trip and he loved it – Got some amazing photos from the top of the Marina Bay Sands hotel. It’s an awesome city and so photogenic. We spent time at Altitude bar (in a high rise building) from dusk to night, the ambiance was perfect with a band playing in the background and the light show at Marina Bay below us. very cool. I must get in that roof top pool next time we go! We did get to one – Craig’s aunty and uncle were living there and had a rooftop infinity pool! Photos on our webiste. The Dream. I’ll have to check out Altitude Bar next time I am there. Thanks for the tip! I’ve been to Singapore three times already, each time with different sets of people. Because of that, I have mostly been to the same places (almost all of the ones you listed above). What never ceases to amaze me is that they have all those parks and zoos for plants and animals, even if the city-state seems like one industrial zone. I think its a really easy city to visit time and time again. I was looking at your blog for itineraries for Italy and came to this page out of curiosity since I am a Singaporean. Really happy to know you enjoyed your stay here 🙂 In addition to your suggestions, you can also head to a heartland area for a more authentic Singapore experience. Depending on the age of the estate, it may have coffee shops and hawker centers (no air con, a little dirty, but with the best food) or food courts (more comfortable with aircon but also pricier. usually in malls). There are also many many interesting cafes popping up , especially in the Tiong Bahru area. Thanks! Great suggestions. I’ll be sure to check them out next time i’m in Singapore. I agree with you ! Singapore is an interesting mix of culture and there is much to see over there, and the food is delicious. Lovely post and a good summary ! wow! i have never been there before. i am interested on Singapore’s life. it has expensive cost life but worth to live there. i am going to Singapore 2 weeks again for 4 days. so can you tell me where another the most visited place is? Hi Erisa. Singapore can be expensive but there are plenty of ways to cut costs with eating out in the hawkers centres and getting around on foot sometimes too. I hope you have a great time in Singapore. Cool thanks for the suggestion. Good that you didn’t take opinions of others seriously and visited Singapore on your own conviction. There is a reason why there is so changes in opinions of people. Perhaps this Lion City had started slow on adding tourist attractions to its wings, but now that it has gained a momentum, things have changed tremendously. 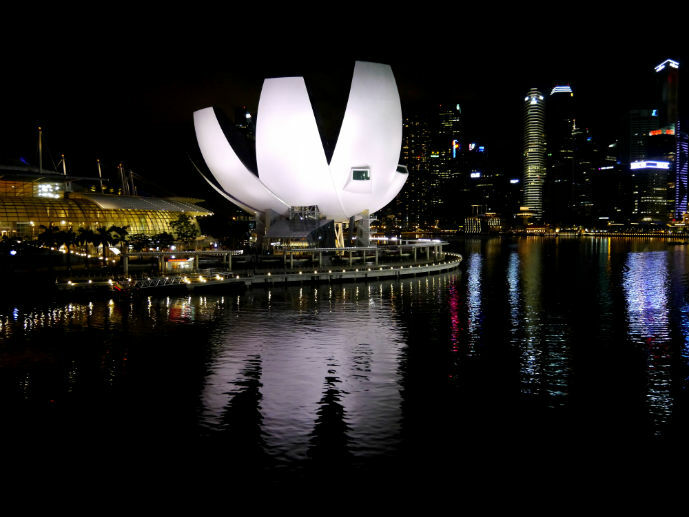 The Singapore government is rather serious in making the country a fabulous tourist destination which people would love to visit time and again. You have rightly said that Singapore is not what it used to in the first decade of 2000. Now it has all the ingredients that can easily inspire any traveler of the world. What’s good about it is the continuous addition of new attraction to its crown each year. This means there would be a couple of more things to add in your post. You can present those as Part II in your next blog. As of now, I can surely say this post will change people’s thinking about Singapore. Thanks Aashi. Appreciate your feedback on the post and glad that you agree with me.